If the name of the game is consistency, then look no further than Lee's Summit senior KC Lightfoot. After a disappointing loss at New Balance Indoor Nationals and a few other disappointing performances to start the season, Lightfoot finally broke through and cleared the 18-0 mark at the Gary Parker Invitational. He is one of five boys to clear 18-0 this season and one of eight to ever do it. 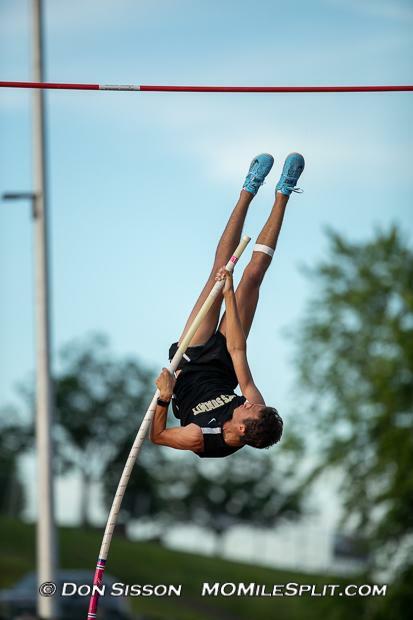 After he cleared 18-5 at the district meet, he became the second best high school pole vaulter of all time. This weekend, he cleared 18-0 for the sixth straight meet and eighth time overall. Since finally clearing 18-0, he has been a man on a mission, continuing to climb each weekend and try to track down Armand Duplantis, though this may be futile (Duplantis cleared 19-5 this season). Lightfoot's high school career comes to an end after his state meet record of 18-0. Chris Nilsen's 17-0 meet record stood for only two years as did his overall state record of 18-4.5, but Lightfoot appears ready to continue to push his limits. He'll be heading to Great Southwest Classic next year and will continue to compete throughout the summer much like last season. The Baylor commit will go down as one of the greatest Missourian track and field athletes in the state's history and should be poised for even bigger things in Waco. We have two more years of this so buckle up. Hazelwood West sophomore Justin Robinson and Park Hill South sophomore Chris Dupree are two of the top talents in the entire state and they have two more years to dazzle us as well. 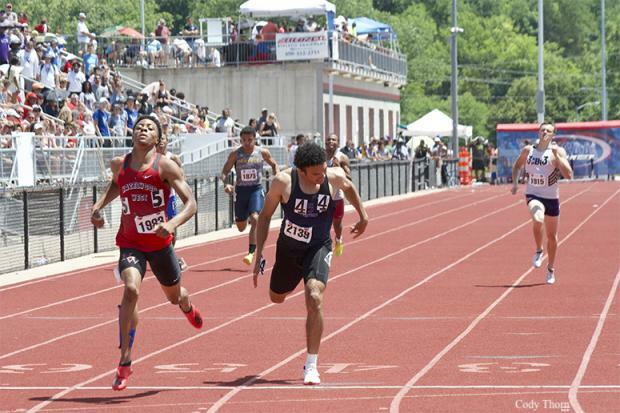 The 400, in particular, was the race to watch as both boys threw down all-time state meet performances with Justin Robinson running a jaw-dropping 46.93 for the win. This was a clear Class 5 record and the third fastest time in state history. Chris Dupree took him to the line, but fell just short with a 47.19, which is the seventh fastest time in state history. Robinson was going for the sprints treble, but after taking third in the 100 to Rock Bridge's Nathaniel Peat and Lee's Summit North's Keyon Mozee (another stud sophomore), that fell by the wayside right away. Robinson would win the 400 and then go on to run away with the 200 (21.62). For Dupree, his weekend was slightly different as he seems to have become more of a 400/800 guy. He started off his weekend with a 1:53.26 in the 4x800 that will make you take not just a double-take, but a triple-take. He then followed that up with his 47.19 in the 400 finals the next day and split 47.39 in the prelims of the 4x400 and 47.94 in the finals. Both boys will soon be on the national radar as they continue to progress. Bold prediction: Chris Dupree joins the soon-to-be-mentioned three super sophomores in the Class 5 800 and goes for the half-mile title next spring. The Kirkwood boys are some of the most talkative and interesting boys you will ever meet. And they are led by two of the most well-spoken boys with which we spoke this weekend in junior Christian Baker and sophomore Martin Strong. The former is your long distance star. Baker used tactical races in the 1600 and 3200 to grab medals in each event, but it was his gold medal performance in the 3200 of which he was most proud. 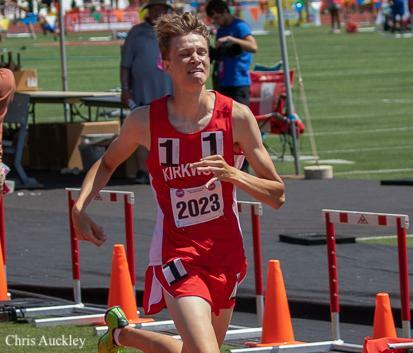 After a breakout junior cross country campaign in which he ran 16:09 and took 29th in the Class 4 race, Baker parlayed that success into a strong winter of training and a state title in the 3200. After a quick Class 4 race taken out by sub-9 man Ryan Riddle, the Class 5 race got out much more honestly in 72. For most of the boys in the race, the 4:48 first mile was a bit of a crawl and put them on pace for a 9:36 for the winner, which would be one of the slowest times in state history to win the largest class's 3200. The pace picked up, though, as the lead group of six boys pulled through 2000 meters in 5:58-5:59. Two laps later, the group had thinned to five between 8:21-8:25, led by Baker, and the race was on. Baker's 59.74 last lap would prove to be the difference maker as he ran away with the title in 9:21.60. It was a big personal best for the junior and he was ecstatic to win his second gold of the weekend after having run a leg on the state champion 4x800 squad earlier. "I just trusted everything we'd been doing with speed and stuff this year and it worked out." "I've run some real good tactical races this year," he remarked, "so that benefited me fortunately." Putting yourself in a good position is the name of the game and for sophomore Martin Strong, he continually put himself in the right position and had the strength to seal the deal in the final 100 meters both in the 4x800 and open 800. After splitting 1:53.29 in the relay for the win and the sub-7:50 time, Strong came back to win the 800 in 1:53.69, running away from two more super sophomores and a junior in the last 100. Staley sophomore Jack Warner out-leaned St. Louis University High's Lazarus Williams as all three boys, along with Nixa's Christian Blake Procell, should provide even more fireworks in the years to come. 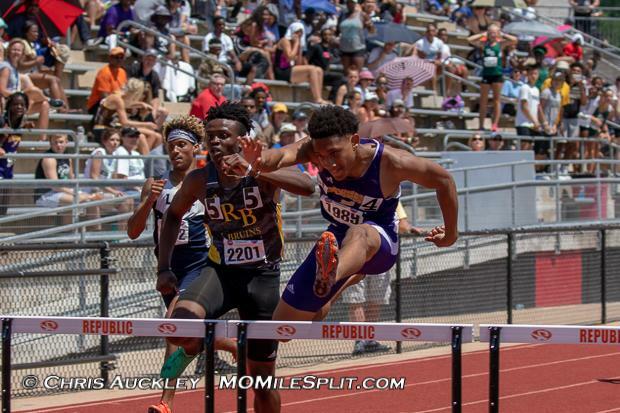 Hickman's Courtney Watkins was not even in our preseason rankings in the 300 meter hurdles this season. He finished the season as the No. 10 performer in the entire country. 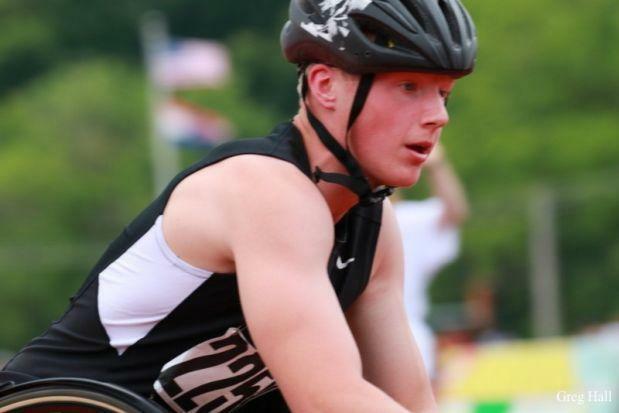 For Watkins, the 36.97 was a pretty big deal as he became the second Missourian under 37 this year, joining Cleveland NJROTC's Antonio Norman in the US top 10 ranks. He is now the Class 5 state record holder and third all-time in state meet history. "I worked my way up and it's good to see my hard work start to pay off... I'm looking forward to (next year) now." The dynasty continues at Lafayette. Senior Nassim Oufattole was handed the torch this season after the departure of Austin Hindman who carried the torch after the departure of Alec Haines, Dylan Quisenberry, and Devin Meyrer and has not disappointed in his final high school season. Oufattole ran 9:08.65 at the Eastern Relays earlier this season and entered the state meet weekend with season bests of 4:18.66 and 1:56.13 season/personal bests. He started off his weekend with a 1:55.78 split in the 4x800 for second and then fell off a bit in the 3200 but held on for eighth in the 3200, 9:39.96. "I've been kind of sick lately...so that was hard. I've never been sick in season...but I just had to work on the mental side, especially in the two-mile, that did not really go how I wanted it to." But even after the disappointment of the 3200, Oufattole was able to come back on Saturday for the victory in the 1600, tracking down an aggressive Boston Small in the final lap to come away with the 4:20.03 victory. Small took it out in 2:06 through the first 800 while the rest of the field sat back in 2:16. "After 800, you're just like, 'I have to go now or I'm just never going to catch him.'" Oufattole now heads off to Massachusetts Institute of Technology (MIT) and plans to continue running in NCAA Division III. He believes, though, that he's leaving the Lancers in good hands. "They're ready," he said, "I'm expecting great things and I'll be back to cheer for them." For Central St. Joseph's Boston Small, it was now or never. The young man had been a strong talent in the northwestern Missouri area the last two seasons, but had still not earned a state medal. On Saturday, he tried to make his first one a gold. Pushing the pace from the gun, Small sprinted out to the front and, much like Riddle in the Class 4 race before him, opened up a three-second gap in the first lap and extended it to ten seconds through 800. "I was just trying to put it on the line. My goal was to run 4:16 and give it my best shot and go for the win. I felt good through 800 but 200 to go I didn't really have it in me, but I was glad to lay it on the line." For Small, he'll take the silver and the personal best, though. "Oh, it's awesome...just getting rewarded for all the hard work, getting the medal, basically throwing up afterwards, I'm happy to be wearing it." Did you know that we saw a US No. 1 800 go down this weekend? You are probably thinking to yourself, sure, Brandon Miller's 1:49.55 right? Wrong. That is US No. 2. Ft. Zumwalt West junior Chris McCoy wheeled a US No. 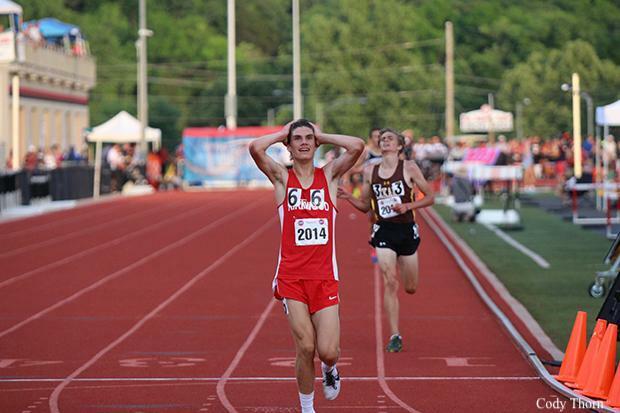 1 2:00.06 in the para 800 on Saturday, shattering his state record and winning big. McCoy also went US No. 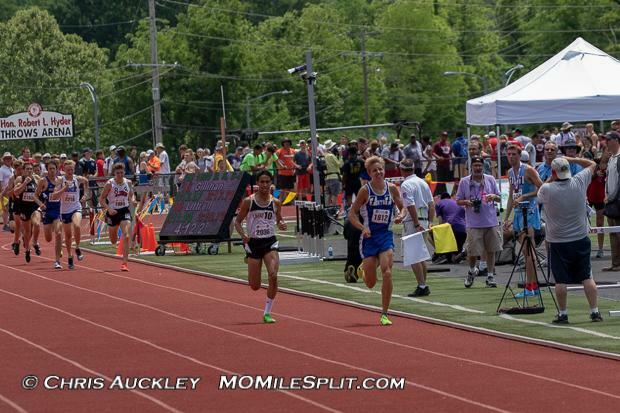 3 in the 1600 with his 4:17.21, once again shattering his state record, and beating Holt's Jason McCabe by 46 seconds. He would have won the Class 3 and 5 races and taken third in the Class 4 race. You can see our interview with Chris McCoy here. 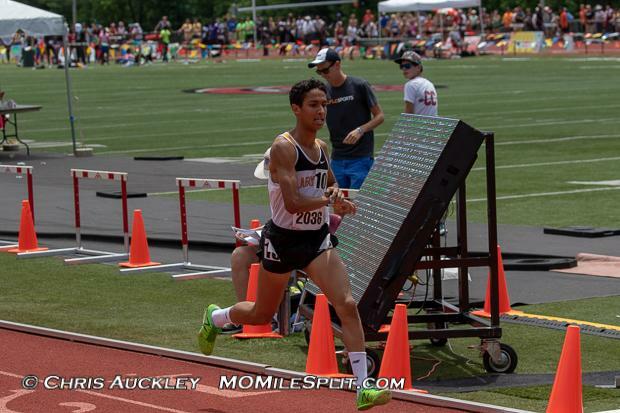 The para events rarely get the attention or fan engagement they deserve, but understand that Chris McCoy is a national talent in the middle distance races and could be the first Missourian to break 4:00 in the 1600 next season...in the para 1600. 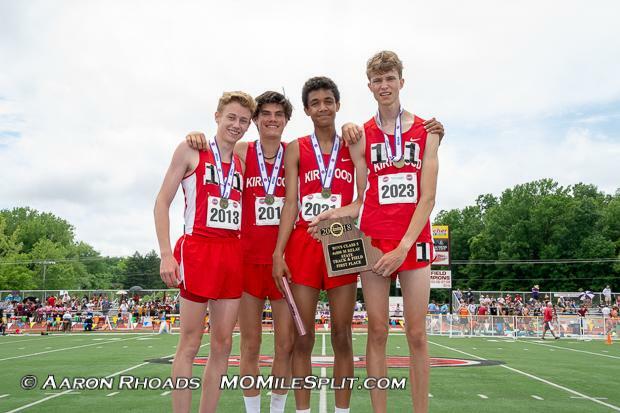 Boys 4x800: Another incredible 4x800 took place in the Class 5 boys race as Kirkwood was able to hold off Lafayette, St. Louis University High, Park Hill South, and Lee's Summit West for the victory. Martin Strong was the key to Kirkwood's win, splitting 1:53.29, but the big story was four other boys also splitting under 1:56 with Harrison Brown, Nassim Oufattole, Lazarus Williams, and Chris Dupree all accomplishing this feat. Boys Shot Put: Daniel Carson of William Chrisman held off Blue Springs' Daniel Parker and Jefferson City's Devin Roberson for the win in the shot put in a personal best 58-6.5 and his first ever state title. 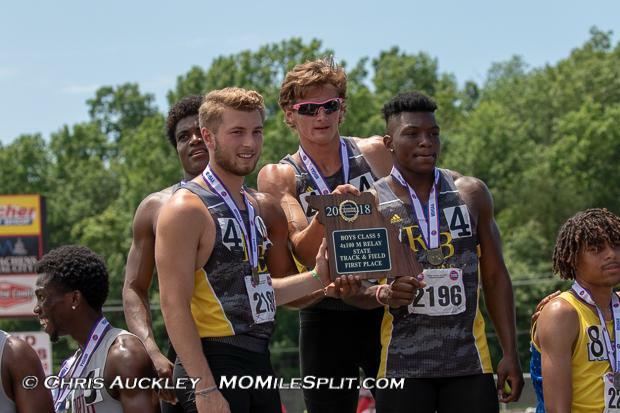 Rock Bridge Boys: The Rock Bridge boys won all three sprint relays, becoming only the fifth team in state history to do that in the large classes. The teams were made up of Eli Darrough, Martez Manuel, Nate Peat, Jackson Jarvis, and Kyjuan Collins. Heading into the 4x400, the Broncos held a 6.5 point lead and just needed to manage the score with Rock Bridge also running the relay. Rock Bridge would go on to win, but LSN took fourth to maintain the point difference by a slight margin and clinch the 1.5 point victory. Lee's Summit North had a number of important point scorers come through for them. Devon Richardson won the high jump and took fourth in the triple jump, Marvin Hopkins and Christian Carter went 2-5 in the long jump, Keyon Mozee and Nyles Thomas went 2-8 in the 100, Matthew Hughey and Isaiah Vigliano went 4-6 in the 400, and they were no worse than fourth in each of the sprint relays. The Rock Bridge boys picked up 30 points from their sprint relays and another 10 from Nate Peat in the 100. 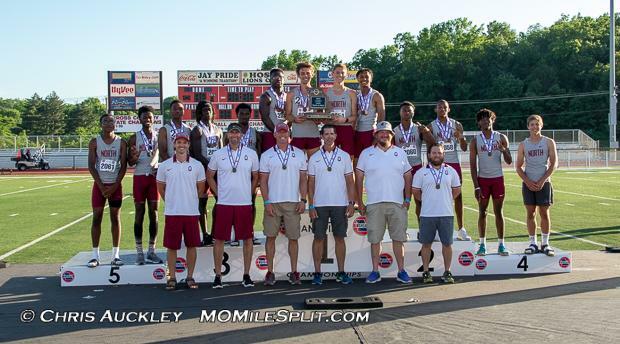 The rest of their points came from Quinton Brown tied for fourth in the high jump and Martez Manuel was third in the 110 meter hurdles and second in the 300 hurdles. Known throughout the past few years as a distance power, the Bruins have flipped the script and, as the young distance squad continues to progress, could be in the early stages of a powerhouse in the near future. 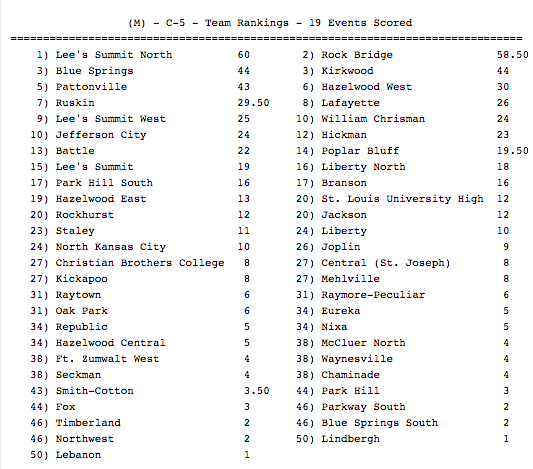 Blue Springs and Kirkwood tied for third. Blue Springs picked up 10 points from Tre Wheaton in the long jump and eight points from Daniel Parker in the shot put. Their 4x800 took sixth, Xavier Hall finished sixth in the 110s and fifth in the 300s, and they picked up seventh and eighth place finishes from Oaklee Hauschild, Gabe McClain, and Colby Velaer, and their 4x200 Relay. The absence of Victor Mugeche's 20 points in the 1600 and 3200 was felt as the Wildcats finished 16 points back of first. Kirkwood scored 44 points with 35 of them coming Martin Strong, Christian Baker, and the 4x800. 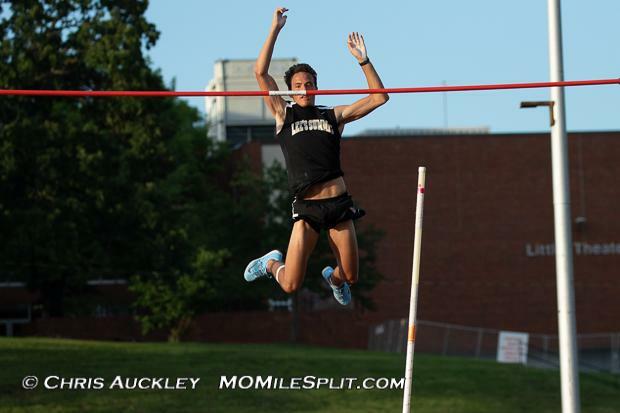 Cooper Wise picked up eight more in the high jump and triple jump and Will Drury, a contender for second in the pole vault, finished in eighth.